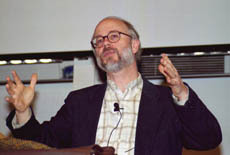 Michael Behe, född 18 januari 1952 i Altoona, Pennsylvania, USA, är en amerikansk biokemist och förespråkare av intelligent design. Behe är professor i biokemi på Lehigh University i Pennsylvania, och senior fellow vid Discovery Institutes Center for Science and Culture i Seattle. Behe är en av evolutionslärans mest kända kritiker och har i sin bok Darwin's Black Box myntat begreppet "irreducibel komplexitet": idén att en del biokemiska system är för komplexa för att ha kunnat uppstå genom evolutionära mekanismer. Behe har kritiserats av ett stort antal forskare och vetenskapliga organisationer, som anser att intelligent design och teorin om irreducibel komplexitet är pseudovetenskap. Även hans eget universitet har tagit avstånd från hans idéer, och betraktar dem som ovetenskapliga. ^ ”Defending science education against intelligent design: a call to action”. http://www.jci.org/cgi/content/full/116/5/1134#B1. Journal of Clinical Investigation 116:1134-1138 American Society for Clinical Investigation, 2006. ^ ”Debating the Merits of Intelligent Design”. Arkiverad från originalet den 8 augusti 2008. https://web.archive.org/web/20080808120635/http://www.stanfordreview.org/Archive/Volume_XXXIV/Issue_8/Opinions/Opinions3.shtml. ^ ”Why Evolution Must Not Be Ignored”. http://www.washingtonpost.com/wp-srv/national/zforum/99/nat082799.htm. ^ ”The "Intelligent Design" Hoax”. http://www.textbookleague.org/id-hx-1.htm. Shulman, Seth (2006). Undermining science: suppression and distortion in the Bush Administration. Berkeley: University of California Press. sid. 13. ISBN 0-520-24702-7 "for most members of the mainstream scientific community, ID is not a scientific theory, but a creationist pseudoscience." David Mu (Fall 2005). ”Trojan Horse or Legitimate Science: Deconstructing the Debate over Intelligent Design”. Harvard Science Review "19" (1). Arkiverad från originalet den 24 juli 2007. https://web.archive.org/web/20070724203349/http://www.hcs.harvard.edu/~hsr/fall2005/mu.pdf. Perakh M (2005 Summer). ”Why Intelligent Design Isn't Intelligent — Review of: Unintelligent Design”. Cell Biol Educ. "4" (2): ss. 121–2. doi:10.1187/cbe.05-02-0071. Mark D. Decker. College of Biological Sciences, General Biology Program, University of Minnesota Frequently Asked Questions About the Texas Science Textbook Adoption Controversy Arkiverad 30 september 2010 hämtat från the Wayback Machine. "The Discovery Institute and ID proponents have a number of goals that they hope to achieve using disingenuous and mendacious methods of marketing, publicity, and political persuasion. They do not practice real science because that takes too long, but mainly because this method requires that one have actual evidence and logical reasons for one's conclusions, and the ID proponents just don't have those. If they had such resources, they would use them, and not the disreputable methods they actually use." ^ Ker Than (23 september 2005). ”Why scientists dismiss 'intelligent design' - LiveScience”. msnbc.com. http://www.msnbc.msn.com/id/9452500/ns/technology_and_science-science/. Läst 17 maj 2010. ^ ”Department Position on Evolution and "Intelligent Design"”. Arkiverad från originalet den 13 oktober 2005. https://web.archive.org/web/20051013000000/http://www.lehigh.edu/~inbios/news/evolution.htm. , Lehigh Department of Biological Sciences, quote: "It is our collective position that intelligent design has no basis in science, has not been tested experimentally, and should not be regarded as scientific." ^ ”Intelligent-design backer fires back at critics - Technology & science - Science - msnbc.com”. http://www.msnbc.msn.com/id/9741900/. Sidan redigerades senast den 20 maj 2018 kl. 13.54.